Tress is the CEO of InterGrain, a leading national wheat and barley breeding business. 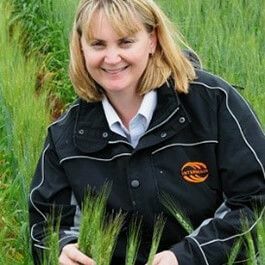 As the CEO she works closely with some of the world’s best plant breeders to develop new higher yielding, broadly adapted varieties for the Australian grains industry. This role involves managing the research and commercialisation relationships with Monsanto and Syngenta. Tress commenced the role as CEO in 2012 and prior to this was InterGrain’s Commercial Manager. InterGrain was formed in 2007 and her initial task was to establish the businesses financial and governance systems and manage the commercial operations of the business. Tress started her career in the small WA wheatbelt town of Three Springs working for the Department of Agriculture Western Australia as an agronomist. She then moved to managing the TOPCROP program in WA. During this time she had the opportunity to explore a personal passion of involving women in the grains industry. In 1999, Tress won the Telstra Young Business Women for WA. In 2000, Tress changed career focus, moving into intellectual property and commercilisation. Tress played a key role in the development of the National End Point Royalty system used in the grains industry across Australia. This value capture system paved the way for private investment in wheat and barley breeding in Australia and the establishment of companies such as InterGrain. In 2015, Tress was named the WA Rural Woman and has been working on a special project ‘Oodles of Noodles’ to raise the consumption of WA grown udon noodles. In recent years, Tress has been active in promoting the grains industry as a career opportunity to school students and a strong advocate for increased women’s participation in the grains industry.